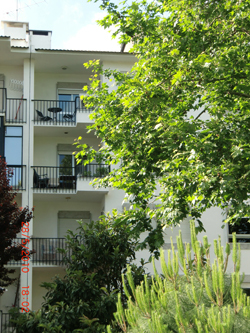 This is a 3rd floor apartment that sleeps four (comfortably) in a quiet, residential neighbourhood. There’s ground level access followed by five steps to the lift. It’s light, bright and spacious with views over both the south-facing front and north-facing rear, well maintained, landscaped gardens. Loquats can even be picked from the trees there in April/May. All windows have blinds and lowering them during the day helps keep the apartment cool. As does the large leafy, plane tree in the front garden. It’s also got air conditioning and heating. It consists of a large, living/dining room, two double bedrooms, a fully equipped kitchen, a bathroom with a shower, and a south facing verandah. 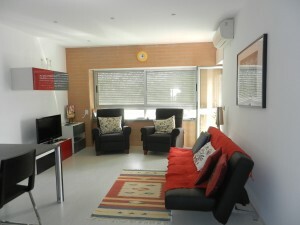 The apartment can be adapted to be used as two double bedrooms, two twin rooms, or one double and one twin room. That’s because the four single mattresses zip together to form double beds if needed. The leather couch in the living room extends to accommodate another sleeper if really necessary. Smoking is allowed on the verandah but BBQ’s are not. Regretfully, pets are not allowed either.